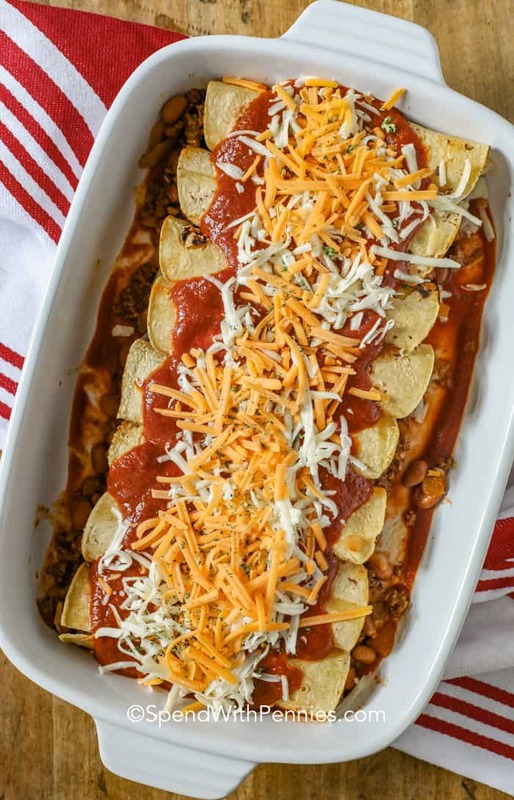 This Beef Enchiladas recipe is a family favorite with a zesty ground beef filling wrapped in corn tortillas and baked until bubbly! Nothing beats homemade beef enchiladas for taco night. Serve them along with some Mexican rice, everyone will come back for seconds. 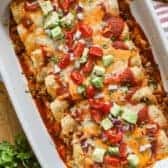 Ground beef enchiladas are quick and easy but don’t be afraid to experiment with shredded pork or leftover baked chicken breasts! 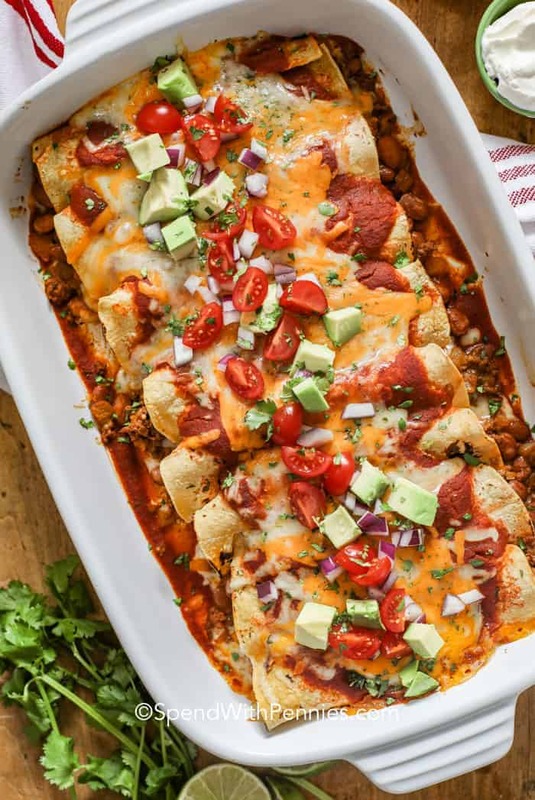 Ground beef enchiladas are one of our favorites dinners along with creamy chicken enchiladas. 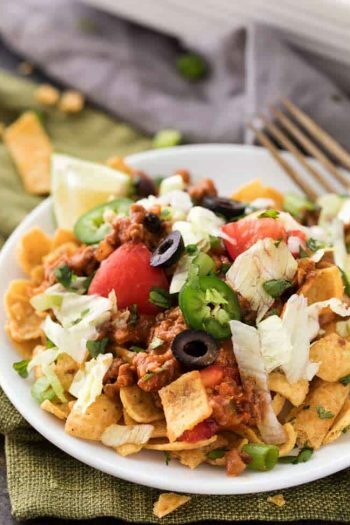 Take your tex-mex game to the next level with this easy recipe! How to Make Enchilada Sauce: Making a beef enchilada casserole is super easy! I prefer to use Homemade Enchilada Sauce but if using canned sauce instead, I usually mix in a little more cumin, red chile, or even salsa. Tortillas: Traditional enchiladas use corn tortillas but if you’d prefer flour, those will work too. To keep corn tortillas from cracking when you roll them, be sure to heat them according to package directions. I usually heat them directly over my gas stove for a moment or two. 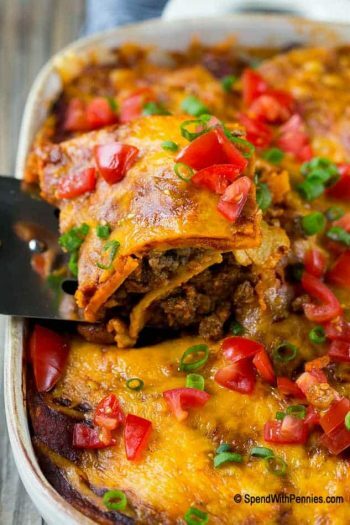 Filling: Most beef enchilada recipes leave wiggle room for more or less of your favorite ingredients. I add pinto beans but black beans work well too. Now for the fun part – assembling these enchiladas! Enchilada filling: Brown the beef and drain any fat. Add in beans, seasonings and a little sauce. Simmer until thick. 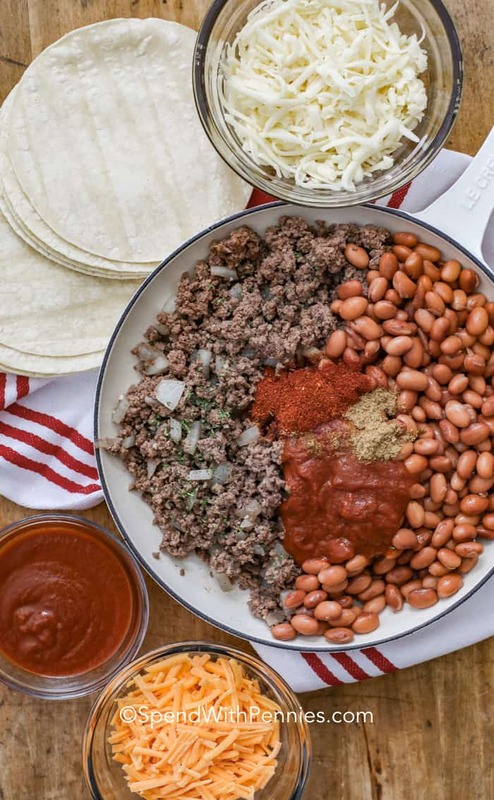 To Roll Enchiladas: Heat the corn tortillas until they are soft and fill them with a little bit of cheese beef and beans. Roll them and place seam side down. Top with more enchilada sauce and cheese. Bake until melted and bubbly. How long to cook enchiladas: You’ll want to cook these beef enchiladas about 20 minutes or so. When cooking enchiladas, you’re more just heating things through since they’re already cooked. Cool about 10 minutes before serving. Serve with a dollop of sour cream, extra cheese and some cold cervezas (or Mango Margaritas)! 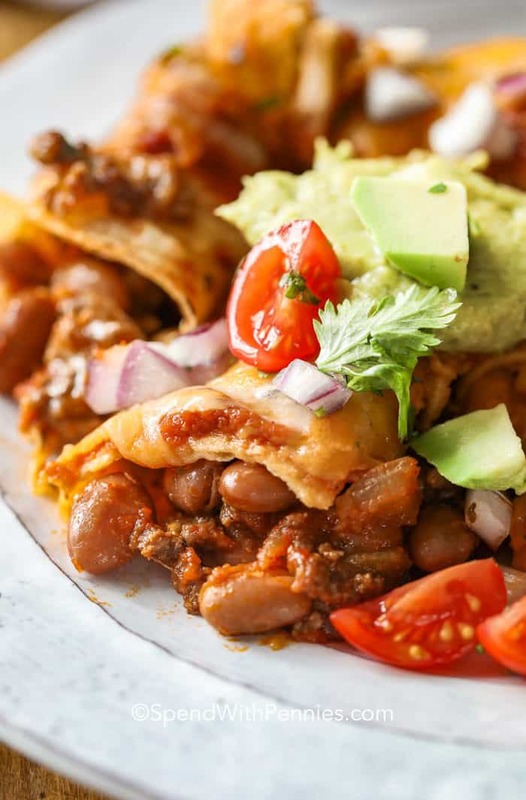 How Do You Store or Freeze Beef Enchiladas? If there are any left, you mean! Store your beef enchilada casserole in an airtight container and place it in the fridge. For freezing an entire pan of beef enchiladas, it’s a good idea to line the casserole dish with aluminum foil before assembling the ingredients. After they are baked, cool completely in the fridge and then cover and freeze. 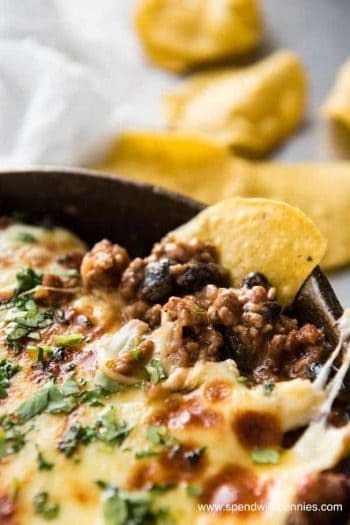 After your enchilada casserole is completely frozen, gently lift it from the casserole dish and wrap, label and return to the freezer. 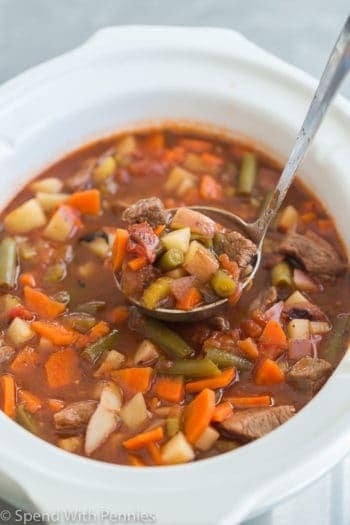 You can also divide the portions and separately wrap and label them as well for a quick and tasty office lunch or quickie dinner for two! 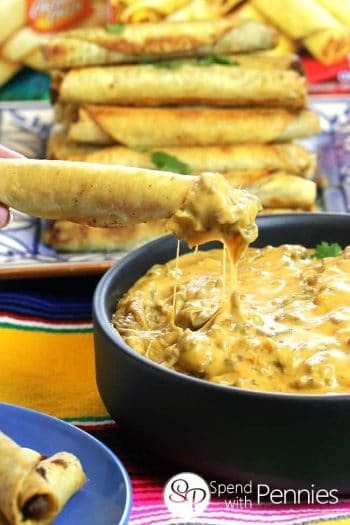 Beef Enchilada Dip – a delicious appetizer! 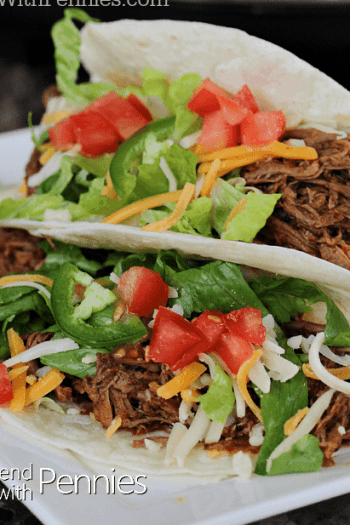 Crockpot Shredded Chicken – great for enchiladas! Cilantro Lime Rice – another great side! This beef enchiladas recipe is a family favorite! Nothing beats homemade beef enchiladas for taco night. Serve them along with some Mexican rice, everyone will come back for seconds. Stir in beans, seasonings, 1/4 cup enchilada sauce, and 1/3 cup water, salt. Simmer until thickened. Spread 1/2 cup enchilada sauce in the bottom of a baking dish. Heat tortillas according to package directions (or over a gas stove) until soft. Place 2 tablespoons cheese and 1/3 cup beef filling in each enchilada. Roll and place seam side down in the pan. Top with remaining enchilada sauce and cheeses. Bake 20-25 minutes uncovered or until cheese is melted and filling is hot.